RICHARD LAINHART is an award-winning composer, author, and filmmaker - a digital artisan who works with sonic and visual data. His compositions have been performed in the US, England, Sweden, Germany, Australia, and Japan, and recordings of his music have appeared on the Periodic Music, Vacant Lot, XI Records, Tobira Records, Electroshock, Infrequency, VICMOD, and ExOvo labels. As an active performer, Lainhart has appeared in public approximately 2500 times. Besides performing his own work, he has worked and performed with John Cage, David Tudor, Steve Reich, Phill Niblock, David Berhman, Rhys Chatham and Jordan Rudess, among many others. In 2008, he was commissioned by the Electronic Music Foundation to contribute a work to New York Soundscape. In 2009, he was one of 200 electric guitarists who performed in the U.S. premiere of Rhys Chatham's "A Crimson Grail" at Lincoln Center in New York City. 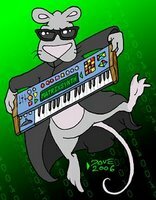 Lainhart's animations and short films have been shown at festivals in the US, the UK, Canada, Portugal, Italy, France, Spain, Germany, and Korea, and online at Souvenirs From Earth, ResFest, The New Venue, The Bitscreen, and Streaming Cinema 2.0. His film "A Haiku Setting" won awards in several categories at the 2002 International Festival of Cinema and Technology in Toronto. In 2009, he was awarded a Film & Media grant by the New York State Council on the Arts for "No Other Time", a full-length intermedia performance designed for a large reverberant space, combining live analog electronics with four-channel playback, and high-definition computer-animated film projection. In January 2010, he performed as a featured Live Media audio-visual artist at Netmage 2010 in Bologna, Italy. In July 2010, he will be a featured performer at Avantgarde Festival Schiphorst in Germany. JAMES ROSS is a guitarist and composer living in Brooklyn, N.Y. Originally from Pittsburgh, PA, he has studied guitar at the University of Pittsburgh and the Mannes College of Music in New York City. He is currently studying North Indian classical music and composition with La Monte Young and Marian Zazeela. ALEX CARPENTER is an Australian-born musician, video artist and researcher based in New York City. 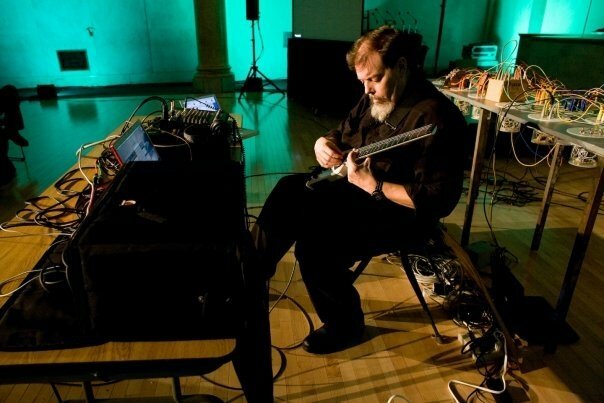 He has performed extensively as a soloist playing guitar, keyboard and electric zither through a self-designed multi-amp and delay network he calls the Live Audio Delay System, and has also independently produced and coordinated over twenty large-scale ensemble performance and multi-media events under the moniker Music of Transparent Means. Alex's most recent performance activity has centered on his own Live Video Delay System, an extension of the audio system which employs multiple cameras and extreme color isolation to facilitate a unique looping and layering of live laser drawings. The system received its first test session at MELA Foundation, NYC, in September 2009, and continues to be seen in performance by New York audiences.